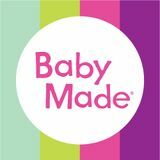 BABY MADE is an Australian owned business that was established in 2003. We are all about creating innovative, modern and unique baby and mum-to-be quality keepsake products and baby gifts. Easily recognisable by the bold coloured striped packaging. Baby Made stands for quality, reliability and ease of use. Designed by parents for parents to create permanent mementos that capture those special moments in time. WALL STICKER MEASME This clear wall sticker height chart continues the age old tradition of writing on the wall to record your child’s growth. Easily removable, this modern look height chart will blend in with any décor and when it’s time to paint, renovate or relocate your memories come with you. Includes a permanent marker to ensure your memories are everlasting. All About Me BABY BOOK BBOOK This new Baby Book is like no other, designed with every configuration of family in mind and catering to the Baby of Today! 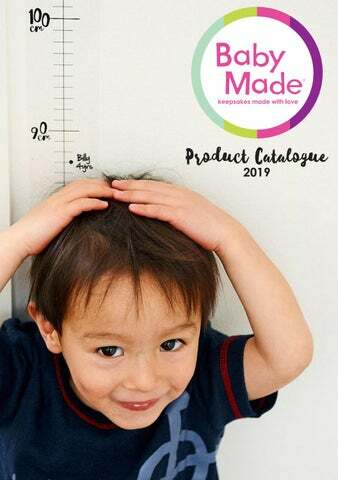 Innovated for busy parents to record all those special memories with ease and fun illustrations, dedicated spaces for monthly photos as well as a cute keepsake compartment. • This inkless print system records baby’s hand and footprints using miraculous inkless technology • 100% Baby Safe, Easy to Use, NO MESS! • Print is permanant and dries instantly. BABY INKLESS PRINT KIT PRINTKIT This popular and award-winning kit enables parents to take four sets of baby’s hand and footprints easily at one time with no mess or fuss. A must have for every new parent and an ideal newborn gift. MY FIRST YEAR DELUXE INKLESS PRINT KIT MYFIRST A premium baby keepsake product meticulously designed to record baby’s first year milestones and growth. This kit allows parents to create hand or footprints at four separate stages during a child’s first year, for instance - from 3, 6, 9 and 12 months of age and conveniently stored forever in a gorgeous keepsake tin. Available in a choice of colours, the Inkless Print Frame Kit is a popular gift for parents and relatives and accommodates a print for the frame as well as the Baby Book! INKLESS PRINT PHOTO FRAME KIT PRK12W/W Decorate the nursery or ofﬁce with a gorgeous framed memento of your child’s hand or footprints alongside a favourite photo. Mount colour is white. MY FIRST BIRTHDAY KEEPSAKE KIT BDAYKP Recall baby’s first birthday for years to come with this adorable 1st Birthday Keepsake kit designed to showcase your favourite first birthday photo alongside baby’s cute hand and footprints. Includes the inkless print system to captures baby’s prints as well as a designated area on the back to record those special first milestones. BABY IMPRINT KIT IMPKIT Create a lasting impression of your childâ&#x20AC;&#x2122;s feet using air drying clay with this easy-to-use, baby safe, mess free kit. Includes easel to display your little ones impression. Ideal newborn gift. BABY HANDS + FEET CASTING KIT HFKIT They grow so quickly! Capture these moments in time forever by creating beautiful 3D sculptures of your babyâ&#x20AC;&#x2122;s hands and feet. PREGNANCY BELLY CASTING KIT BELKIT This kit is so easy-to-use, 100% safe and includes everything youâ&#x20AC;&#x2122;ll need to create a fabulous belly cast, a fun life-lasting experience for every mum-to-be. ULTRASOUND FRAME ULTSOUND Expectant parents can now display baby’s ﬁrst image with this speciﬁcally designed ultrasound frame. Includes the saying ‘Made with Love’ or your own personalised message.